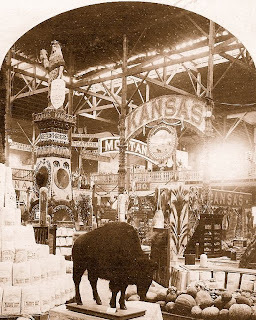 The Kansas State exhibit was located in the north-eastern portion of the New Orleans exposition's Government & States Building. 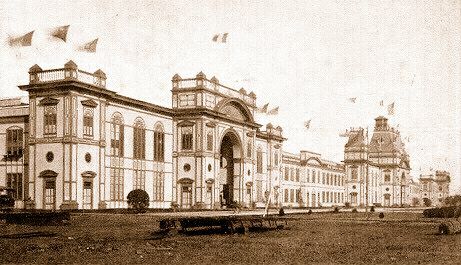 From an artistic point of view, the 10,175 square-foot Kansas exhibit was considered to have no rival among the other state exhibits. 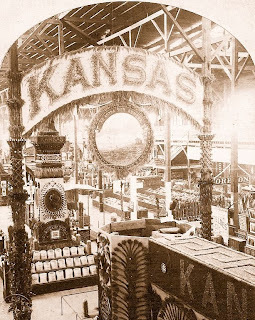 A large arched sign, located over the extensive displays, was painted with each letter of "Kansas" in imitation of golden grain; with the great seal of the state suspended beneath. At the center of the exhibit was placed a large statue of Ceres, formed of grains and grasses, standing upon an ornately decorated pedestal. An abundance of agricultural wealth surrounded Ceres, consisting of corn, wheat, rye, and other grains; in addition to a prominent display of the state's sorghum industry. Various mineral resources were shown, including numerous examples of coal, lead, and zinc. Another feature of the display was a large exhibit of evaporated fruits, of some forty varieties. Through an error by the Kansas legislature, a larger appropriation of funds were not made available for the state's display; and many of the artistic decorations were incomplete due to this unfortunate oversight.